Senior point guard Matt Oestreich’s jumper with three seconds left lifted UW–Platteville to a 63–62 WIAC victory over visiting UW–La Crosse on Saturday night. POSTED January 17, 2018 12:06 p.m.
A last-second jumper by senior point guard Matt Oestreich lifted UW–Platteville to a 63–62 Wisconsin Intercollegiate Athletic Conference victory Saturday night on Bo Ryan Court. The Pioneers (13–2, 3–1 WIAC) struggled to keep pace with the Eagles in the first half, falling behind by as many as 10. Baskets by freshman guard Alex Ranney and Oestreich cut that deficit to six at the break, 32–26. A layup by Ranney with 15:16 left in the game pulled UW–Platteville to within three at 40–37 and neither team led by more than three the rest of the way in a back-and-fourth affair. A minute later the Pioneers took their first of eight leads in the final 14 minutes on an Oestreich 3-pointer. The Eagles (9–6, 1–3) regained a 58–57 lead on a Ben Meinholz jumper with 4:24 left. They extended the lead to three on two occasions down the stretch, the last on a Meinholz jump shot with 1:17 left that made it 62–59. UW–Platteville junior center Clay Gerds scored on a putback with 52 seconds to trim the deficit to a single point. The Pioneers then forced a turnover with 26 seconds left and on the ensuing posession Oestreich buried the game-winner with just three seconds left on the game clock. Meinholz got off a desperation 3-pointer that went off the backboard as time expired. Oestreich led four Pioneers in double figure scoring with 15 points. He also grabbed four rebounds. Gerds had 14 to go along with six rebounds, sophomore guard Carter Voelker scored 11 points and passed out four assists, and Ranney had 10 points for the victorious Pioneers. Taulvish McCray led the Eagles with 11 points. Meinholz, Tanner Bruchs and Brendon Manning each scored 10 points in the loss. Visiting UW–Platteville stood toe-to-toe with seventh-ranked UW–River Falls before the Falcons pulled out a 91–84 victory last Wednesday in the new Page Arena on the UWRF campus. Senior Robert Duax scored 29 points, Jake Showalter 13 and Quentin Shields 11 for the Pioneers, who led 47–35 at the half. Senior Alex Herink paced four Falcons in double figures with 24 points, while Devin Buckley had 21, Austin Heidecker 15 and Clay Seifert 14. The Pioneers used a 17–7 run over the last 6:15 of the first half to take the 12-point lead into the locker room. Six different players scored during that stretch for Coach Jeff Gard’s club. By scoring the first six points of the second half, the Falcons cut the deficit to six and turned the contest back into a tight fight. Herink’s two free throws made it 52–52 with 13:34 left, and Heidecker gave the home team the lead for good at 56–54 on a layup with 11:38 remaining. The Pioneers were within 71–69 late, but the Falcons scored five straight points and forced the visitors to start fouling. The last 15 UWRF points came via free throws, as the Falcons held a big advantage from the line. River Falls made 36 of 42, and the Pioneers hit 15 of24. NEXT: The Pioneers host #13 UW–Oshkosh tonight at 7 p.m.
UW–Platteville (12–2, 2–1) — Jake Showalter 13, Matt Oestreich 8, Robert Duax 29, Carter Voelker 10, Clay Gerds 6, Alex Ranney 2, Quentin Shields 11, Trey Sigel 3, Dan Lowe 2. Totals — 30-57 15-24 84. UW–River Falls (11–2, 2–1) — Clay Seifert 14, Devin Buckley 21, Alex Herink 24, Matt Keller 7, Brennan Witt 4., Jalen Greenlee 3, Chris Laymon 3, Austin Heidecker 15 Totals — 23-54 36-42 91. 3-point goals — P: 9 (Showalter 2, Duax 3, Voelker 2, Shields 1, Sigel 1), RF: 5 (Buckley 3, Greenlee 1, Laymon 1). Team fouls — P: 29; RF: 24. Fouled out — RF: Witt, Heidecker. UW–La Crosse (9–6, 1–3) — Taulvish McCray 11, Tanner Bruchs 10, Ben Meinholz 10, Nolan Wright 7, Brendon Manning 10, Sam Skoyen 2, Milton Cummings 3, Terek Nesheim 9. Totals — 22-56 11-11 62. 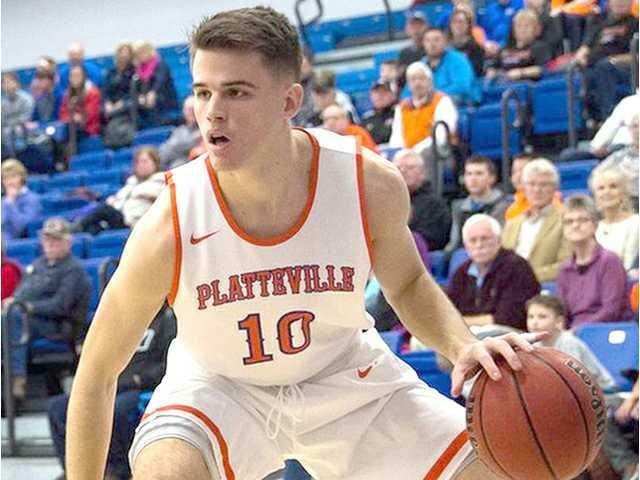 UW–Platteville (13–2, 4–1) — Jake Showalter 4, Matt Oestreich 15, Robert Duax 4, Carter Voelker 11, Clay Gerds 14, Alex Ranney 10, Quentin Shields 5. Totals — 24-50 9-12 63.